Movember is an annual event involving the growing of mustaches during the month of November to raise awareness of men's health issues, such as prostate cancer, testicular cancer, and men's suicide. The Movember Foundation is a multinational charity that helps men live longer, healthier and happier lives. 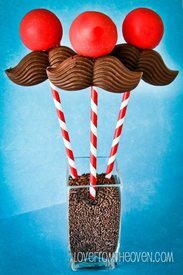 Bring awareness to Movember with these fun and delicious chocolate mustache cake pops from Love From the Oven!